Imagine the following scenario: you run IT for a large consumer electronics retail chain, and you’re pulled away from your Thanksgiving dinner by an urgent phone call. The point of sales (POS) system is down at your flagship location. Eager shoppers are lining up for the midnight Black Friday opening. Black Friday sales make the difference between profit and loss, so it’s critical that the store open on time. Frantically, you ask the branch manager, “When were the DR plans last tested?” A long pause followed by ‘umm….’ confirms your fears. With little optimism, you instruct the branch manager to implement the DR plans. While this may be an extreme example, I use it to make a point: today’s retail shop environments are heavily reliant on IT, and highly critical, with massive risks and costs associated with downtime. Even in a less extreme scenario where checkout attendants switch over to a manual or paper process if a POS system is down, there can still be significant consequences. A study last year found that 50% of customers who had to wait in line for longer than 5 minutes would avoider that retailer or brand in the future. Yet like many branches, retail shops often lack the protection and DR plans to keep them up and running at critical times. It’s time for all of that to change. 1) Optimize in-store apps. As the retail experience becomes increasingly digital, in-store apps drive revenue and operations. SteelFusion helps you centralize corporate applications like Exchange and SharePoint while delivering a fast experience to remote users. Customer-facing and backroom apps like inventory and time management that must continue to run locally are hosted directly on the SteelFusion platform. SteelFusion ensures continuous operations of your store despite network outages with the added benefit of letting you store and manage servers and data centrally, transforming how you provision, protect, and recover services. 2) Streamline POS servers. Arguably the most critical app in the retail store is the point-of-sales terminal. SteelFusion eliminates the need for a dedicated POS server. Virtualized Windows-based POS servers run on SteelFusion to eliminate costs while providing additional security by encrypting customer data. SteelFusion’s data centralization means near-real time customer data is available in the datacenter for analysis. 3) Power digital signage. A critical component of a modern in-store experience is the use of digital signage for promotions, advertising, content, and pricing. Many of these need a dedicated media server running in the back room. SteelFusion eliminates the need for the dedicated infrastructure that powers the digital signage. With SteelFusion, you can run the media engine on the converged appliance to cut costs – and leverage built-in WAN optimization to optimize and prepopulate video content. 4) Monitor customer experiences. How do you monitor the experience of customers using new in-store applications? Are you meeting your internal SLAs with these apps? To solve this, SteelFusion can provide telemetry and remote application and traffic monitoring. When coupled with Riverbed SteelCentral performance management, you can provide in-depth monitoring of transactions, user experience, and infrastructure performance. 5) Breakout customer WiFi traffic. Another emerging element of the modern retail store is customer WiFi. With SteelFusion you can eliminate the need to backhaul internet traffic across the corporate backbone. Built-in WAN optimization with Path Selection enables you to send WiFi traffic – customer or corporate – directly to the Internet. With SteelFusion you can easily leverage lost-cost Internet links and reduce the cost of bandwidth at each store location by 5x. 6) Eliminate racks of IT infrastructure. Chances are each of your stores includes file, print, domain, and directory servers. You can eliminate the physical server and storage infrastructure associated with these servers by converging them onto the SteelFusion all-in-one platform. Customers commonly reduce racks of equipment down to a single 1U appliance. SteelFusion delivers power, cooling, and space savings and will easily fit into backrooms without complicated wiring. 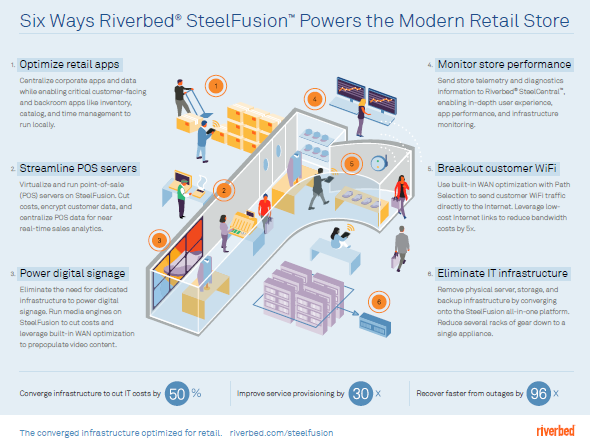 Learn more about SteelFusion for your retail branch sites.